Source: Twin Lakes Reservoir and Canal Co.
A recent photo of the water behind the Lincoln Gulch Diversion Dam on Lincoln Creek that forms Grizzly Reservoir. Repairs to the outlet gate were completed on Oct. 6 without having to drain the standing water at the bottom of the reservoir. 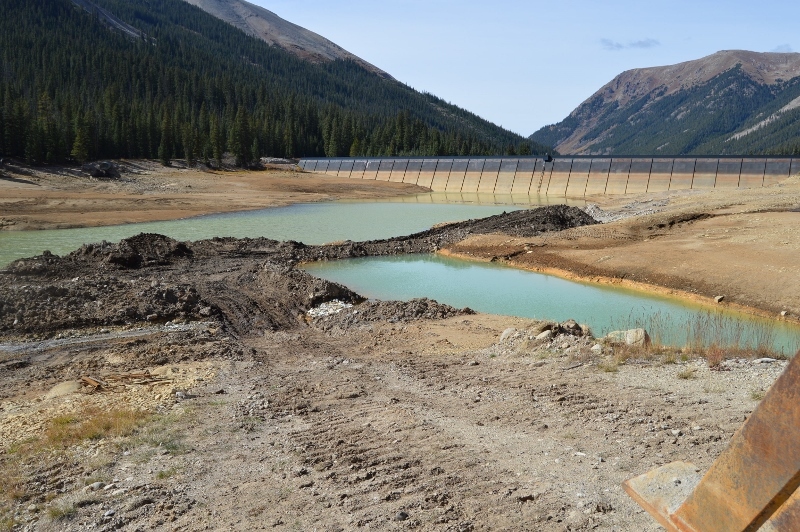 ASPEN – Nine weeks after the Twin Lakes Reservoir and Canal Co. drained Grizzly Reservoir in early August due to the failure of an outlet gate in the dam across Lincoln Creek, repairs have been made and reservoir operations are returning to normal. But the usually obscure company is now also facing questions in state water court about its diversions through its larger system, which moves about 40,600 acre-feet of water a year from the headwaters of the Roaring Fork River east to Aurora, Colorado Springs, Pueblo and Pueblo West. On Tuesday, a new seal was installed on the bottom of the dam’s outlet gate, according to Scott Campell, general manager of the Twin Lakes Reservoir and Canal Co. The installation of the relatively simple rubber seal was done underwater by crews standing in knee-deep water, reaching down to tighten the bolts on new steel straps holding the seal in place. By working this way, they didn’t have to release the remaining dirty water at the bottom of the reservoir, as was done Aug. 10, when 10 to 20 acre-feet of muddy, yellowish water was released from the bottom of the reservoir and sent down Lincoln Creek and the Roaring Fork River. After the release of water in August, the flow in the Roaring Fork near Aspen jumped up from fewer than 70 cubic feet per second to more than 160 cfs in a few hours and alarmed residents notified local public officials about the color of their local river. Subsequent testing Aug. 13 by Lotic Hydrological for the city of Aspen found “elevated levels of several dissolved metals including aluminum, copper, iron, manganese and zinc” in Lincoln Creek and the Roaring Fork River because sediment in the bottom of Grizzly Reservoir includes material washed down from the historic Ruby Mining District and the naturally acidic upper Lincoln Creek Valley, according to a report provided by the city of Aspen. The levels of aluminum and iron exceeded state standards, but no fish kills were reported. The city is awaiting results of recent testing for insect health on the river, according to April Long, Aspen’s stormwater manager. With the repairs in place, water is now backing up again behind the dam on Lincoln Creek, and the reservoir, which normally holds 570 acre-feet of water, is expected to contain 300 acre-feet by Oct. 20, Campbell said. The small reservoir primarily acts as a forebay to Tunnel No. 1, which allows for as much as 625 cfs to be moved from Grizzly Reservoir under the Continental Divide and into to the south fork of Lake Creek and down to Twin Lakes Reservoir. Tunnel No. 1 and Grizzly Reservoir are the central components of the larger Independence Pass Transmountain Diversion System, which is owned by the Twin Lakes Reservoir and Canal Co. and diverts water from the Roaring Fork River and Lincoln, Grizzly, New York, Brooklyn, Tabor and Lost Man creeks through a series of dams, ditches and tunnels. The water rights for the Independence Pass system have a priority date of 1930 and a court-issued decree from 1936. The water originally was diverted to grow crops in the lower Arkansas River Valley, but cities gradually bought the rights to the water. It offered evidence to the court that it has now physically diverted an additional 21.33 cfs of water through the Lost Man Canal, which today can carry as many as 272.33 cfs of water from Lost Man Creek to Grizzly Reservoir. On Sept. 30, Pitkin County, the city of Aspen, the Stillwater Ranch Open Space Association, and Anthony and Terri Caine of Aspen each filed so-called statements of opposition in the case. The Stillwater Ranch subdivision is on the Roaring Fork River east of Aspen, and the Caines own a home on Wildwood Drive west of Independence Pass. Corona specifically points to a 1976 decree, which includes limits and conditions on Twin Lakes’ right to divert water. “Twin Lakes must show that they diverted water in accordance with their water court decrees, including the restrictions the court included in the 1976 decree from Case W-1901 regarding storage in Twin Lakes Reservoir and the amount of water available to the Colorado Canal,” Corona said. The decree, for example, states that if there is enough water in the Arkansas River to provide a certain amount of water to the Colorado Canal, then Twin Lakes does not have the right to divert water for that purpose. Laura Makar, an assistant Pitkin County attorney specializing in water cases, said the county filed its statement of opposition to ensure that Twin Lakes was held to “strict proof” regarding its historical diversions. The resulting water court process could shed more light on the operations of the Independence Pass system and could do so just as a new level of communications has been established between Twin Lakes and various officials. 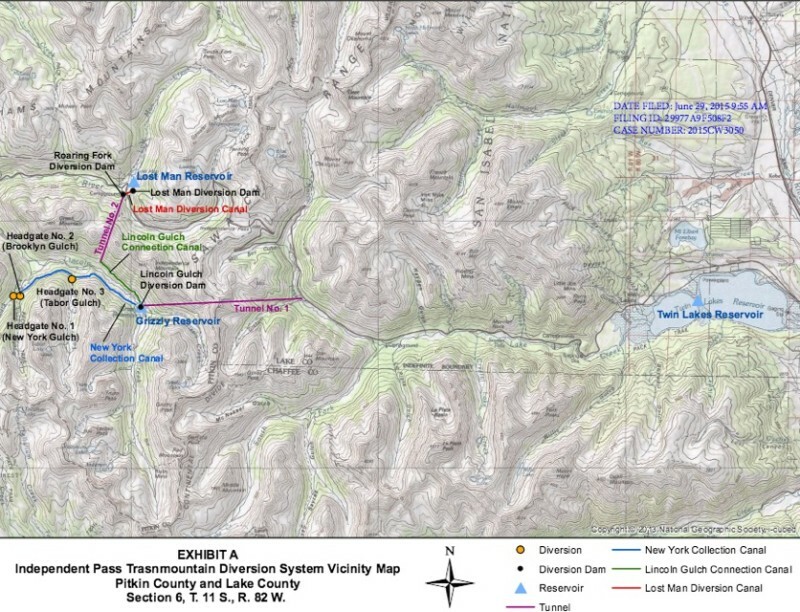 A map of the Independence Pass Transmountain Diversion System, as submitted to Div. 5 Water Court by Twin Lakes Reservoir and Canal Co. In early August, when Scott Campbell realized that Twin Lakes had lost the ability to store water in Grizzly Reservoir behind a damaged and leaking outlet gate, he made the rare call to drain the reservoir. But in his rush to prevent a catastrophic release of water, he had failed to inform local and state officials of the pending release of muddy water from the bottom of the reservoir on Aug. 10, an oversight he has since acknowledged and regrets. Over the past two months, Campbell has been working to repair both the seal on the outlet gate in the dam and his relationships with various officials. In a sign of progress on both fronts, Campbell sent out a notice Friday that the repairs were complete and that by Tuesday, the reservoir would begin releasing about 1 cfs of water and do so through a sediment-trapping system below the reservoir. Through a prearranged notification system, Campbell sent his update on Friday to the Pitkin County dispatch center, which in turn sent it out to various officials. When asked about the water court case, Campbell referred questions to Kevin Lusk, president of the Twin Lakes Reservoir and Canal Co.
Photo: courtesy of Twin Lakes Reservoir and Canal Co.
A sediment filtering system has been set up below the outflow gate on the dam at Grizzly Reservoir. 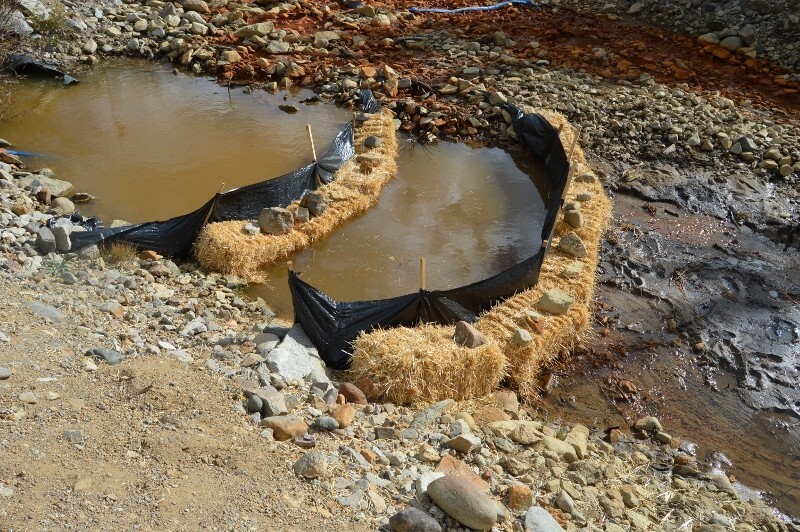 The silt fencing and straw bales has been an effective way to trap sediment coming out of the reservoir, according to Scott Campbell, the general manager of Twin Lakes Reservoir and Canal Co.
Lusk is also a principal senior engineer with Colorado Springs Utilities, which owns 55 percent of the shares in Twin Lakes. The Pueblo Board of Water Works owns 23 percent of the shares in Twin Lakes, while the Pueblo West Metro District owns 12 percent and the city of Aurora owns 5 percent. Lusk characterized the water court application from Twin Lakes as modest. Lusk also said the city of Aspen’s opposition to its application was routine. He also said that Phil Overeynder, a senior utilities engineer for the city of Aspen, had called him in advance about the city’s filing of a statement of opposition. “Phil assured me this is not an indication of any change in our cooperative relationship,” Lusk said. The city is working with Twin Lakes on the management of other water rights that may allow more water to remain in the Roaring Fork River for environmental reasons, city officials have said recently. But it remains to be seen how hard Pitkin County and the parties represented by Corona, the Aspen water attorney, will push on the issue of whether Twin Lakes has strictly adhered to the requirements of the 1976 decree. Editor’s note: Aspen Journalism is collaborating with The Aspen Times and the Glenwood Springs Post Independent on coverage of rivers and water. The Times published this story on Sunday, Oct. 11, 2015 and the Post Independent published it on Monday, Oct 12, 2015.